Stop. Smell that? That’s the smell of an Apple rumour – Macworld must be imminent. 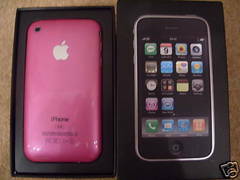 The above photo has appeared on eBay, of what appears to be a pink iPhone – notice the writing on the back of the phone, which proves it’s not just a respray. Whilst this wouldn’t normally be news, something is going to have to be launched at Macworld, and there’s a chance it could be this. I guess. Maybe. Although honestly? If Apple has resorted to making a 3G iPhone in pink, I think someone needs to have a word with their R&D department. More Apple news? Click here. Shiny Poll: what did Santa get you?